It is amazing how art can influence other people’s mood, opinion and perspective in life. Art forms such as music, literature and visual arts have been a major element in shaping culture, social behavior and freedom of expression. Art is powerful enough to bring change in the society by just using creativity and passion. YTD’s featured project for this week is another showcase of how art in the form of paper crafts reflect the state of a society and switch moods, turning fear and greed into inspiration and hopelessness into a beacon leading the way out. This particular project is called “Freedom on Paper“, initiated by a talented illustrator from Belarus, Vola Kuzmich. The project was born last 2011 as a reaction to the moods that dominated the most socially active part of Belarus at that time. Political repressions struck the country after the presidential elections last December 2010. Ban on public protests or any kind of gathering left the streets of Minsk empty and grey. 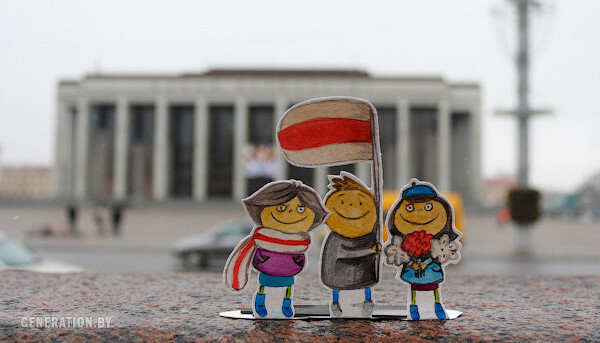 Vola’s weak smiley paper characters with symbolic flags gathered in the streets of Minsk when the public was incapable of doing it. The project was a success having more people taking their own photos of the printed paper characters in different cities of Europe as well as in the US. Since then, “Freedom on Paper” received various local and international recognition, nominations and awards. You The Designer is lucky enough to talk to Vola and ask her some questions to give us a closer look about her inspiring project. Check out our short interview below. YTD: Hi Vola, welcome to You The Designer! Share us a little background about you and your design work. VOLA: I’ve been working as an Illustrator and Animator in Minsk, Belarus for over 8 years. I make editorial illustrations on socially relevant topics, drawings for advertisements and games, animated interactive projects and mobile apps. My works have received more than 10 awards in various festivals of advertisement and communication. My deliberate move toward political expression through art and design coincided with the beginnings of my involvement in the student movement approximately 10 years ago. Drawing and designing are the primary ways that I like to convey my ideas: I prefer to emphasize a subject by artistic methods rather than any other means. But it is pleasant and fascinating, to be sure :) I really love what I do and it inspires me to draw in two daily shifts, not infrequently, and involve holidays as well. My inspiration for working on social topics originates often from publications on the site: Generation.by, of which I am co-founder and creative community coordinator. Character creation, emotions and motions, and perception of the irony in life are my favorite things to portray through my drawing. Usually my characters are kind and expressive, as even villains or just bad guys have some humane characteristics. I like to accent on difficult questions by simple artistic images. My project “Freedom on Paper” stems precisely from this idea. Organizing the first episode took a day in all, but it was very important to make it in that same day and by those simple romantic images. YTD: You have an interesting project called “Freedom on Paper”. What is the nature of this project and what does it aim for? VOLA: This art project was born in 2011 as a reaction to the political atmosphere among the most socially active part of society at that time. Belarus, often referred to as “the last dictatorship in Europe”, saw another wave of political repressions after the last presidential elections in December 2010. The spring of 2011 was depressing: not only to the oppositional politicians, but also to the average citizen. Newspapers were revealing new arrests every day. The complete ban on public protests and any kind of assemblies left the streets of Minsk empty and grey. The first episode of this project appeared as a reflection on a historical date for Belarus: an unofficial national day of independence called Freedom Day, which was impossible to celebrate cheerfully that year. It seemed to be impossible that the national white-red-white colors will be seen in the city on March 25th. Weak smiley paper characters with white-red-white symbols did the impossible: they gathered in the streets of Minsk when real people could not. The project reflects on the state of the society and has the aim to switch the moods: turn fear and greed into inspiration and hopelessness into a beacon leading the way out. Drawings on paper and streets have become a form of art reflection, but characters are quite different. In this way the other episode was about musicians who found themselves in the middle of an absurd situation: being unable to perform on stage or TV/radio in their own country. Using some ideological reasoning, the anonymous “list of banned artists” included more than 50 musicians, playwrights, novelists from Belarus as well as from Europe and the USA (including Kevin Spacey, Jude Law, Bonobo, Tom Stoppard etc. who were saying about supporting of democratic changes in Belarus). In a couple of days the concerts of famous Belarusian alternative bands were cancelled one by one. As opposed to the sad news about the cancelled concerts, the Internet spread the news that “Banned Musicians Performed at the Biggest Stages of the City”. This time the clearly recognizable paper characters (8 popular musicians) were placed next to the biggest concert halls of Minsk. YTD: The little paper characters are the stars of this project. Can you share us the creative process in creating them? From where did you start? VOLA: I was just looking for a fitting art form to realize my idea. Usually I make digital illustrations, but in this case I took out brushes and paper. The artistic method was not a random choice. The watercolors on paper emphasize the sublimity and fragility of the tiny characters. The series is vividly simple and low budget. A girl with an umbrella, cheerful youngsters at the central square, an old lady with a bag of treats, white-red-white hot-air balloon and other celebratory images describe a national holiday in a typical European city. They are friendly and optimistic characters despite the sad and depressing atmosphere on the streets. A half a day of drawings, sleepless nights carrying into the mornings and… we were outdoors with paper team. The project was done during the day when many were afraid to go out. In execution of the project, we took the paper figures and went to the most recognizable places of Minsk. Minding the policemen, we were placing the paper characters at the squares where big actions of protest and public celebrations had taken place. After that we quickly uploaded the photos to Generation.by youth media under a positive and provocative title “White, red,andwhiteinthestreetsofMinsk”. As a result it appeared among the top stories at the biggest information hubs. The project expressed the emotional state of Belarusian society in terms that were clear: even to the foreign public who are not especially familiar with the situation in Belarus. The visual tools that were used became a means of communication across the borders. It felt like the mood was indeed changed. «Freedom on Paper» has received thousands of positive reviews, as well as formal awards and inspired followers both in Belarus and abroad. An unexpected, but very pleasant, outcome of the project was the appearance of the followers in Belarus and abroad. They print the images and take their own photos of the tiny paper characters in the streets of different European cities. As a result of the strong demand, the photos from both episodes were uploaded online in a format suitable for print for free use by the followers. YTD: Photography also played an important role in this project. How did you choose the locations of each scene? VOLA: The realization of this project has helped me develop with my unfailing workmate, a photographer: Jura Sidun. We purposely chose the most recognizable places in the city to show context as well to direct the general atmosphere in the city and highlight contrast between bright romantic wishful images and the gray walls of a lonely city. YTD: Which of the paper characters is your most favorite so far? VOLA: Usually my favorite character or illustration is the last one that I drew. But I treat all of my characters kindly: every one has its own peculiarities. I like the finesse of the old lady with her treats: how she holds a little flag near her heart while the grey Republic palace that associates with government and other colors of the flag are behind her. I like a girl with the red and white striped ribbon in her hair: dreaminess and courage, to stay in the center of the city so confidently and quietly, though it might be dangerous. YTD: Any other future plans for this project? VOLA: There are many cases when freedom in only on paper, be that as it may, I don’t schedule art action precisely. This project is a reflection on the events that surround me, and this is an open project. For today the paper characters have visited different countries around the world, and photos of them have taken part in numerous expositions. It’s nice that this project inspired other people, and this inspired me in turn as well. What do you think about this inspiring project? Share us your thoughts and comments by leaving a message below. Stay awesome everyone!